Are you looking for something different for getting details on news and events? Maybe you like to scan the headlines or just read news summaries. And, maybe you like apps that keep you up to date and remind you of current events. 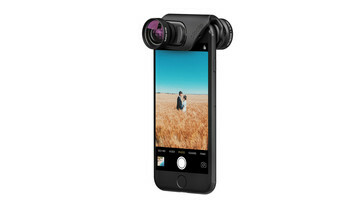 If you are in the market for a tool that does both, then check out theSkimm. Not only does the app provide daily news stories, but syncs with your device calendar so that major events are all in one spot. Today provides a brief look at what is happening on the current day. 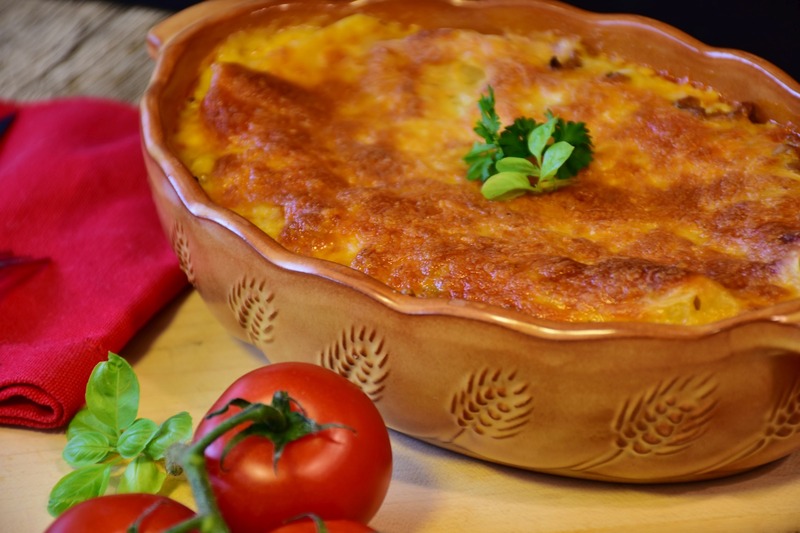 Whether it is a holiday or a big sporting event is taking place, you will see it right off the bat. Skimm Ahead gives you a glimpse into the future. See events coming up from when there will be a full moon to the season premiere date of a popular TV show. 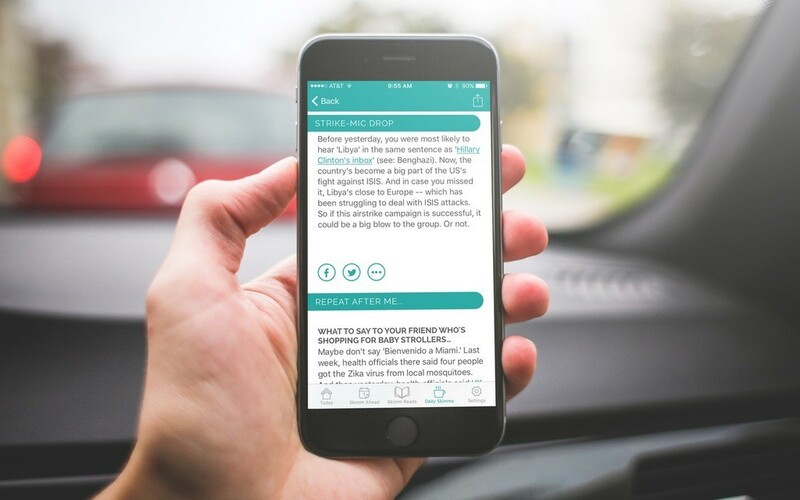 Skimm Reads provides five-minute reads on various news topics such as entertainment, lifestyle, business, and sports. You can also take a look at book recommendations which show you brief descriptions along with direct links to Amazon to purchase the books. 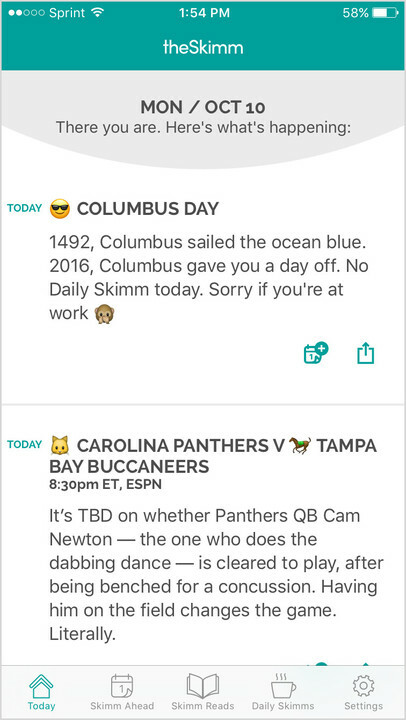 Daily Skimms lets you get your news at a glance each day. You will see an amusing quote, summaries of hot news items, reading recommendations, and other interesting nuggets of news and information. 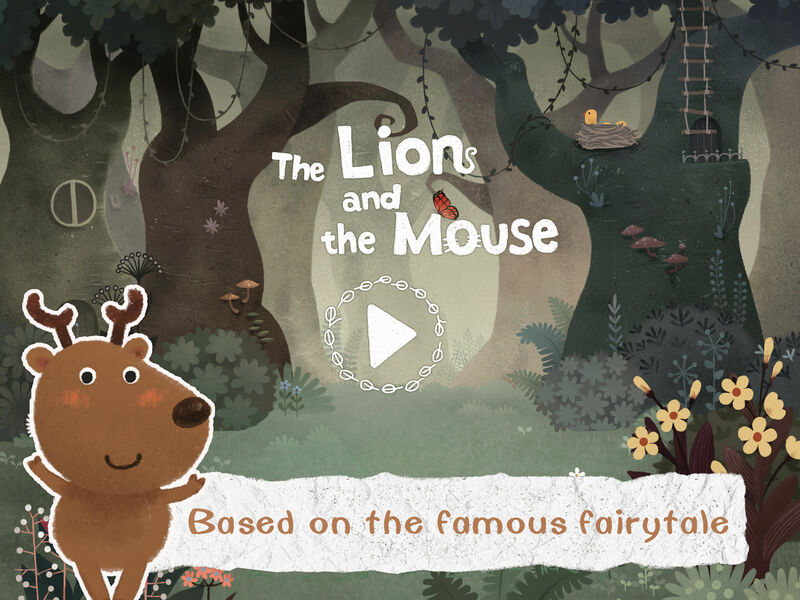 You can read the full stories and share items easily. 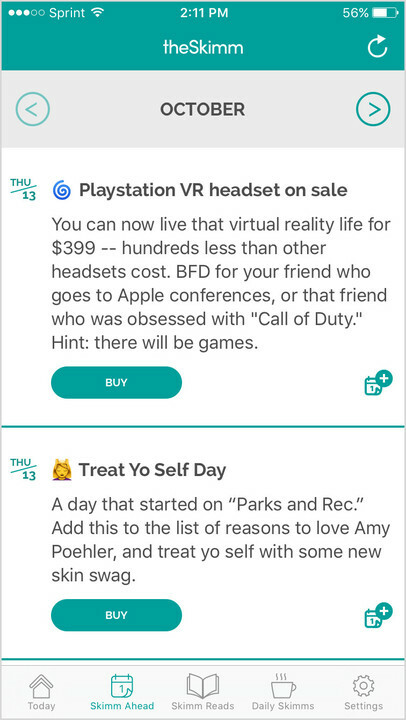 The app also includes three separate notifications to alert you when the Daily Skimm, five-minute reads, and Skimm Ahead sections are ready with something new. When you first create an account with theSkimm, you can immediately connect your device calendar, but can also do so later within the app settings. This puts all of the events from the app right onto your own calendar with alerts and all. This means you will never have to wonder when the PlayStation VR headset goes on sale, when National Pasta Day is, or when the Heisman Trophy will be awarded. 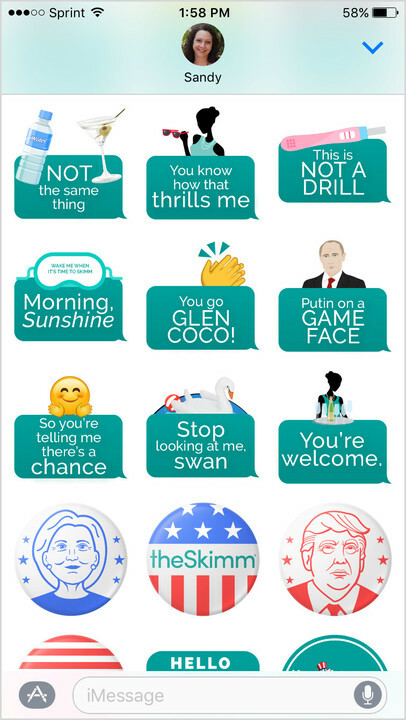 If you have been enjoying the new iMessage stickers that came along with iOS 10, you can check out theSkimm Stickers app. Show support for the presidential candidates or share your plan for a pre-Friday party with the nifty options available. 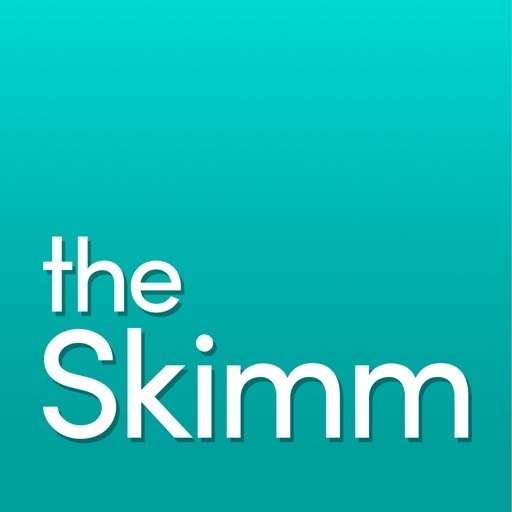 Both theSkimm and theSkimm Stickers are designed for iPhone and iPad. You can download each app for free on the App Store. However, theSkimm comes with a free 30-day trial upon download and has a subscription at $2.99 per month or $29.99 per year after the trial ends. For the calendar syncing and Daily Skimms alone, the app definitely offers some cool features. The interface is clean, smooth, and responsive and the delivery of the news stories is upbeat and fun with a bit of wit and humor thrown in. 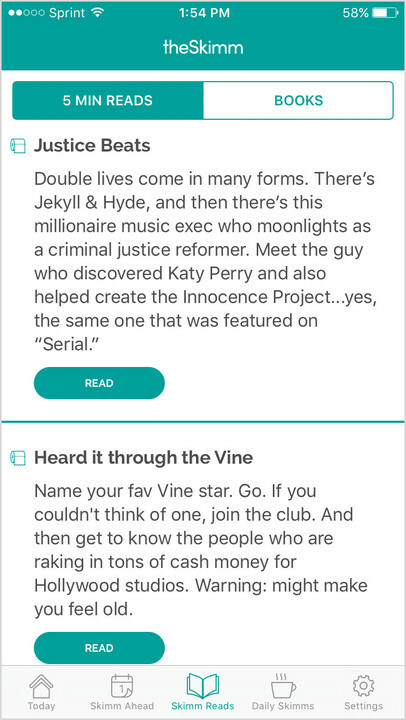 While the Skimm Reads provides a nice variety of stories on different news topics, the book recommendation portion seems a bit out of place with links to buy the books rather than “read” them. 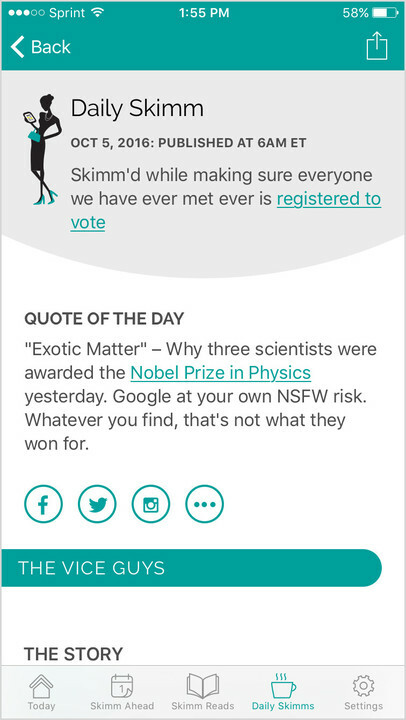 But, overall theSkimm is a handy app to have and you get a full 30 days to check it out for free.